Lisinopril is a long lasting ACE (angiotensin-converting enzyme) inhibitor that works as a competitive inhibitor of ACE. Lisinopril inhibits the conversion of angiotensin I to angiotensin II. Decreased concentration of angiotensin II in blood plasma causes reduction of blood pressure. Three mechanisms could be involved in lisinopril effect: decreased vasoconstriction, increased renin activity and decreased aldosterone secretion. 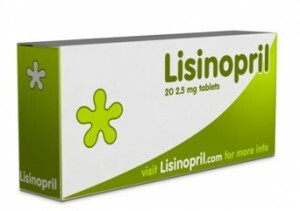 Lisinopril is supplied as tablets or as a preparation of suspension. It is available in generic form, but is marketed as Prinivil by Merck. AstraZeneca also markets Lisinopril as Zestril. Lisinopril's onset of action occurs approximately 1 hour after administration and it lasts for 24 hours. Before the introduction of lisinopril in the early 1990’s, there were only two ACE inhibitors (captopril and enalapril) which were used in the treatment of hypertension. Its introduction into modern medicine is certainly beneficial for patients. Compared with other ACE inhibitors, lisinopril has several distinguishing properties: long half-life and tissue penetration, hydrophilic, and is not metabolized in the liver. Lisinopril is primarily used to treat hypertension, also known as high blood pressure. It is also prescribed to patients who are at risk for, or who have recently suffered from, congestive heart failure, acute myocardial infarction and heart attacks. Additionally, Lisinopril can be used to prevent the renal and retinal complications that often arise from diabetes, though this is one of its less common functions. Also included are micro-albuminuria and new onset of diabetes mellitus. Lisinopril may also help to prevent symptoms of migraine. Lisinopril can be prescribed alone or in combination with other medications to treat medical conditions especially those that involve the heart and the blood vessels. Once administered, the medication helps block the action of angiotensin-converting enzyme which stimulates the blood vessels to constrict or narrow down. The drug (just like any other ACE inhibitors) causes blood vessels to relax and allow blood to flow freely thereby lowering blood pressure. This relaxing effect on the blood vessels minimizes the workload of the heart and increases the efficiency of the heart. Both of these effects are beneficial for patients with congestive heart failure as well as increase the survival percentage of MI (heart attack) patients. Lisinopril is available as a prescription medication hence it is important to take it exactly as directed. Usually, lisinopril tablet is taken by mouth, once a day. It is recommended that you take this drug during the same time of the day to maintain the desired serum levels. Make sure that you read and understand the directions before taking this drug. Never take more or less of the prescribed dose. Doctors would normally start the treatment with a low dose of lisinopril then gradually increasing the dose as needed. Heart failure and high blood pressure are both chronic conditions. Lisinopril does not completely cure them instead manages them into a controllable level. Do not discontinue or adjust the dosage even if you feel well, unless with approval from your physician. When using suspension: shake the bottle well before each dose. Use always the special measuring device that comes with the suspension to prevent the intake of an incorrect dosage. The dosage of the medication depends on the condition and response of the patient. When it is indicated for children, the dosage is based on the weight. It is better to take the medication regularly, at the same time every day. This is important for getting the most benefit from the treatment. It is very important to continue taking the medication even if symptoms have disappeared unless the doctor recommends something different. Inform your doctor in case of symptoms do not improve or worse. Lisinopril can produce some side-effects, especially until the body gets adjusted to it. Inform your doctor it these symptoms persist or worse. Do not take lisinopril together with other medicaments unless it is indicated by your physician. Do not double the dose in case of dose missing. If a dose is missed, it should be taken as soon as possible. If the time of the next dose is near, then skip the missed dose and resume your usual dosing schedule. It is unknown if lisinopril passes into breast milk. Before breast feeding consult your doctor. Safety and efficacy in children younger than 6 years old have not been established. Lisinopril is contraindicated when there is suspicion of anaphylactic reaction or reported allergic symptoms related with previous administration of this medication. Lisinopril should not be used together with potassium phosphates because both, lisinopril and potassium phosphates increase serum potassium. Pregabalin can increase the toxicity of lisinopril by synergism, for that reason they should not be taken together. Inform your physician and pharmacist if you have any known allergy most especially to this drug or other ACE inhibitors such as benazepril, captopril, enalapril, fosinopril, moexipril, perindopril, quinapril, ramipril, trandolapril and others. Potassium supplementsYour physician may need to adjust your dosage or monitor you closely for possible side effects. Tell your doctor if you are pregnant or have plans to be pregnant or if you are breast-feeding. When pregnancy is detected lisinopril should be discontinued. Lisinopril intake during pregnancy may result in foetal injury and/or death. Before you have surgery, including dental surgery, be sure to inform your healthcare provider that you are currently on lisinopril treatment. Contact your physician right away if you experience any adverse effects or if side effects do not go away.